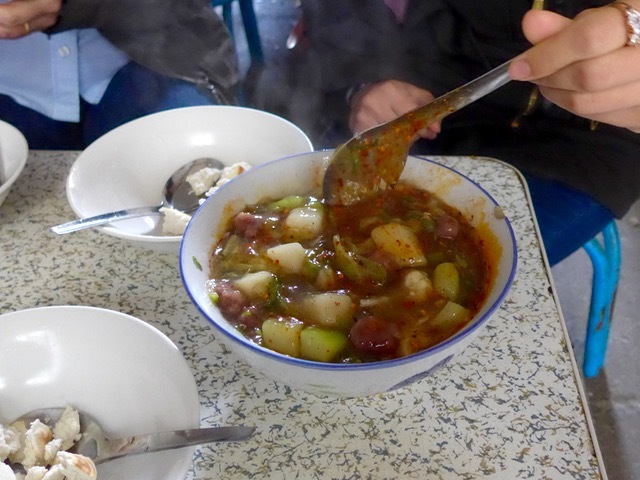 Market Manila - A Fabulously Hearty Soup in an Alleyway… - Beef/Lamb, etc. Stop #2 on the Lost Plate Food Tour that morning was a ginormous cauldron (batya or filipino laundry basin more accurately describes it actually) of steaming soup. Thick enough to be a stew, it was a stick to your ribs (literally) type of breakfast treat. This couldn’t have been much past 9 in the morning or so, and there were lines for this particular purveyor. The soup, made with little lamb meatballs, cabbage and various other vegetables, probably a starch thickener of some sort, or one of the veggies acted as a natural thickener, was heady with aroma and chockfull of stuff. at about $1 or just a little more, it seemed like an incredible bargain, all over again. 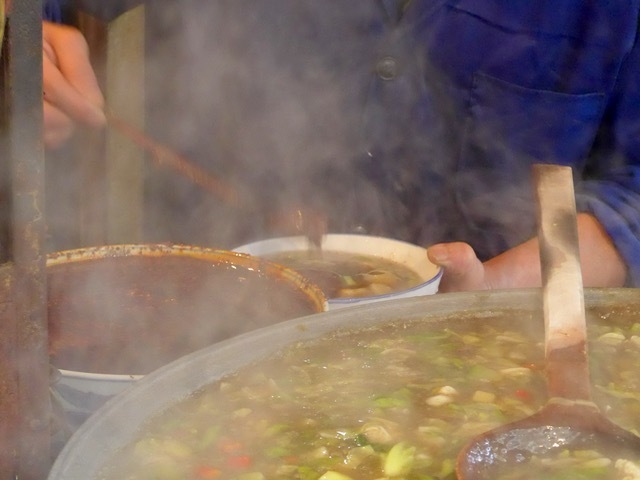 Several ladles full of soup are placed in a large bowl. The man serving it makes very, very pointed efforts to count the number of meatballs that get included in each bowl, then you can choose a little or a lot of chili sauce, chopped herbs and greens to go on top of it. I love how abundant these servings are, you don’t get the feeling that it’s all carefully costed and measured to the gram (except for the meatballs, of course)… and it definitely looked like one got his money’s worth. It’s heavily vegetable inclusive, but the strong flavors of lamb also make this meaty at the same time. 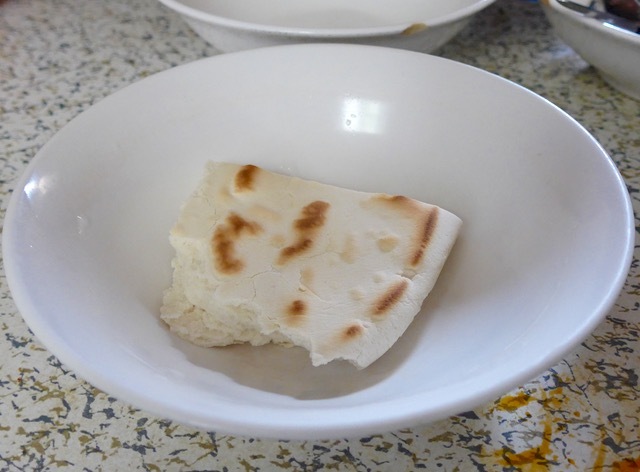 You get an old or dry piece of bread for each bowl (we split one order into three bowls) and you break this bread up into little pieces. Ladle the soup over this and mix until the bread absorbs the liquid and it all gets even thicker and heartier. It’s got your carbohydrates, vegetables and protein all in one bowl. I found this a bit heavy and I have never liked starch-thickened soups, but I must say, it was delicious nonetheless. I don’t think I could have finished a whole order, but it was definitely worth the experience. 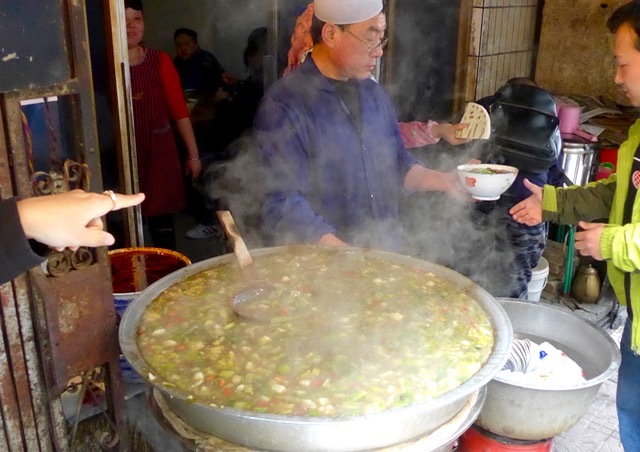 It was still a bit cool the morning we set out on this tour, so a bowl of hot soup was a welcome treat. Probably the servings are not as massive as or as cheap as Xian, but the closest thing we probably have is the Binondo food tour of Ivan. I believe you’ve featured his tour early on in the blog. The price of a meal in BPO offices here in Manila normally range from P55 to P70, rice included. Of course the vendors don’t pay rent but those are the price points that seem to be the most acceptable to the employees. Produce is pretty cheap in China. I guess that’s why cooked food ends up cheap as well. Cabbage, for example, is 1.99 RMB/kilo and often goes down to 0.99 RMB when it’s on sale. This is supermarket price, mind you. The corner veggie stands (they are everywhere) will be a bit cheaper. Carrots, corn, lettuce, potato, broccoli, and cauliflower are other vegetables that VERY rarely cost more than maybe 7 RMB/kilo. How they are farmed, however, is another story. LOL I’m not complaining, though! 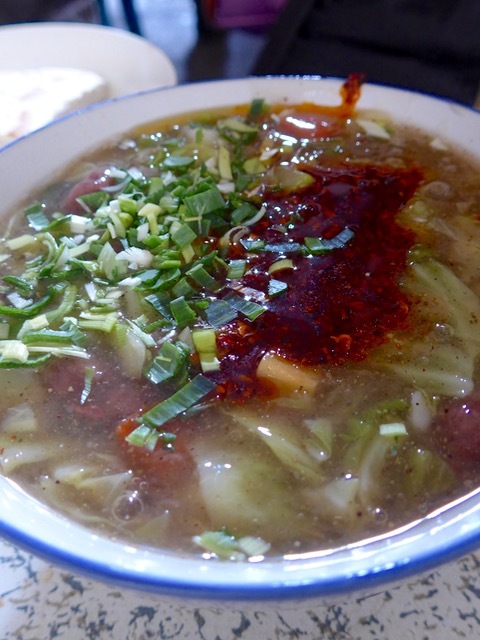 My best bowl of soup was from a sidewalk hotpot in Hanoi while almost squat on a low stool. The rest of my family who I did not join for lunch walked out of the nearby restaurant with a so so expression on their faces. I was grinning ear to ear, happy with my food adventure. 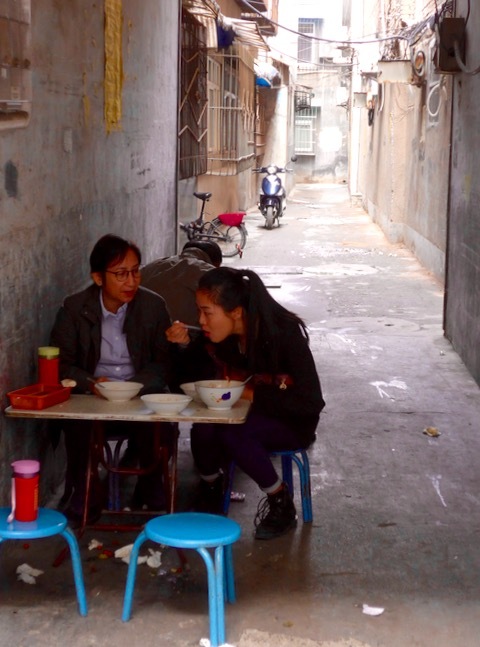 It is usually on the streets and in little alleys like this that some of the best food awaits. 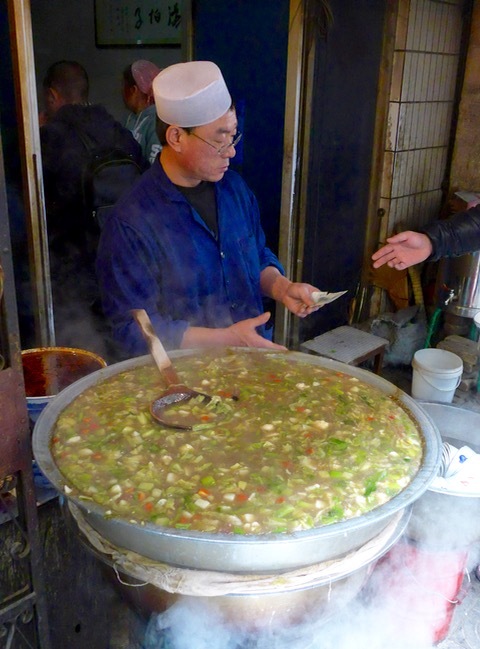 I remember sitting on a low stool over a gutter in a tiny alley just to enjoy some fantastic slightly-fermented rice noodles in boiling hot pork-based broth. Better than some restaurants! Hearty soups make gratifying meals. It’s just hard to control the salt, when ordering in restaurants. Can’t help	but notice the sparkle on the last photo! I’ve always ascribed the cheap food prices in Vietnam and China to their communist past. You know, champion the agricultural laborers, food for the masses, etc. Any takers? One of those unforgettable meals where chinese love to burp out loud after a hearty meal and clear their throats from deep within only to spit after a gulp of tea. Ahhh memories . . . Haha. . . Yes and the projectiles. . . I have somehow forgotten those meals until you mentioned it in this article. As the british tourists with me then would say, ”Lovely’. Haha. $125,000 In Tips?! For A Six Day Trip?! ?